Objectives: The objective of the following study is to find out the effects of two different pushing techniques in the second stage of labor on postpartum maternal fatigue and APGAR score of neonates in Saudi females, as very few such studies are available in these patients. Hence this study was carried out in this population to see the results and to do a comparison with other studies in literature as well as to find out how we can make labor awareness in our females. Settings: It was carried out in two hospitals in the eastern province of Saudi Arabia from 1 January, 2011 up to 31 December, 2011. One hundred Saudi women who fulfilled criterion were included in the study. They were randomized and the results seen. Results: There was a significant difference in postpartum fatigue within 60 min and 24 h in two groups as P = 0.001, P < 0.001 respectively. There was a significant difference of APGAR score of newborn in both groups, i.e., P < 0.001. Conclusion: It is concluded that physiological pushing technique has a better outcome with regard to postpartum maternal fatigue and neonatal APGAR score when compared to directed pushing during the second stage of labor. هدفت هذه الدراسة لمعرفة تأثير أسلوبين للدفع في المرحلة الثانية للمخاض على إرهاق الأم بعد الولادة في عينة من النساء السعوديات وعلى مقياس أبكار (RAGPA). للأطفال حديثي الولادة وهدفت الدراسة أيضًا للتعرف على كيفية رفع وعي السعوديات فيما يتعلق بالمخاض. أجريت هذه الدراسة التقريبية التجريبية بمستشفيين بالمنطقة الشرقية للمملكة العربية السعودية في العام 2011م حيث اختيرت مائة إمراة ممن استوفوا الشروط بصورة عشوائية. أظهرت النتائج فرقًا إحصائيًا معتبرًا بين إرهاق ما بعد الولادة خلال ستين دقيقة وأربعة وعشرين ساعة في المجموعتين. كما أظهرت فرقًا إحصائيا معتبرًا في مقياس أبكار (RAGPA) لحديثي الولادة في المجموعتين. وخلصت الدراسة إلى أن أسلوب الدفع الطبيعي في الولادة أدى إلى نتائج أفضل فيما يتعلق بإرهاق الأم ومقياس أبكار مقارنة مع الدفع الموجه خلال المرحلة الثانية للولادة. Nature carefully orchesters a unique plan for labor and birth. The primary force is the uterine contractions, which lead to cervical dilation and effacement. The secondary force is the abdominal wall musculature, adding to the primary force and hence the labor is interplay between primary and secondary forces. The aim of this study was to explore the fetomaternal outcome in two different techniques during the second stage of labor and maternal fatigue in the postpartum period in Saudi females. It was a Quasi experimental study conducted in delivery rooms and postpartum units of tertiary care hospitals of the eastern province of Saudi Arabia. Both are tertiary care centers with high admission rate of parturients. It was carried out from 1 January, 2011 up to 31 December, 2011. Primigravidas at 37-42 weeks of gestation. The complicated labor and patients with co-existing medical or obstetrical risk factors were excluded to avoid confounding factors. Hundred primigravidas fulfilling the criteria were randomly assigned as control or experimental group. Demographics and personal profile such as age, education, residency and occupation were noted. Obstetrical data such as booked, unbooked, duration of pregnancy and complication during pregnancy were noted as well. The course of the second stage of labor according to the assignment was observed. Visual analogue fatigue scale (VAFS), developed by Hukison  [Figure 1] was used extensively to measure pain, nausea, dyspnea and level of fatigue within 60 minutes and 24 hours after delivery. VAFS has ten horizontal lines with written description at each end. Data was coded, entered in MS Excel 2003 and Statistical Package for social science (SPSS) version 15 was used to calculate the results. The variables were presented mathematically by median and interquartile range. The differences and associations were statistically tested by non-parametric test, namely Mann-Whitney test, Friedman and Wilcoxon test. Comparison between groups was done by square and Mann-Whitney test. Regarding the APGAR score ≥7 as good and <7 as depressed relative risk, incidence of depression in control and experimental groups was calculated. 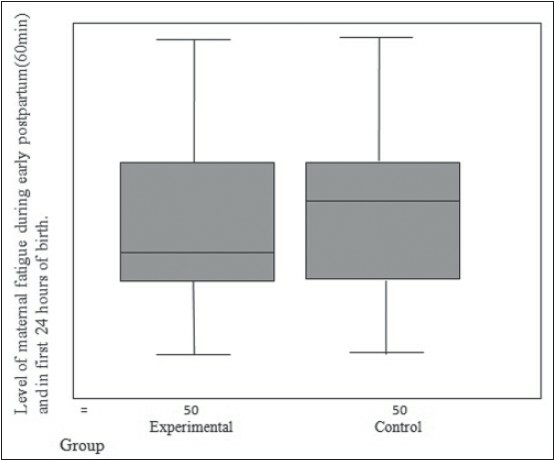 The study showed that the experimental group (spontaneous pushing) during the second stage of labor had less median value of fatigue as compared to control (directed pushing), i.e., 3 compared to 4.5 during the first stage and 5 compared with 7.5 during early second stage of labor, 4.5 compared to 9 within 60 min after delivery and 3 compared with 9 during first 24 h postpartum. 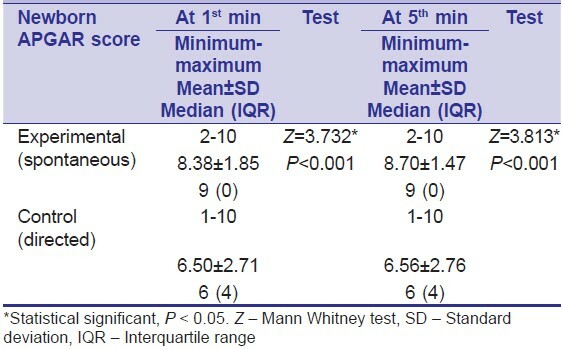 These differences were statistically significant during early second stage of labor, within 60 min and 24 h postpartum, as P = 0.001 and P < 0.001 respectively [[Table 1] and [Figure 2]. Regarding the APGAR score in control and experimental group, it ranged between 2 and 10 in experimental (spontaneous pushing) and 1-10 in control (directed pushing) groups. The median APGAR score was significantly higher in experimental when compared with the control group as P ≤ 0.001 [Table 2]. Also, the study showed that the majority of the experimental group about 92% and about 72% of the control group had an incidence of fetal heart rate deceleration. Eight percent of neonate under experimental group and 28% under control group required admission in neonatal intensive care unit and needed special consultation (P ≤ 0.001, P < 0.05 and P < 0.05 respectively) [Table 2], [Table 3] and [Figure 3]. Labor is a stressful time both for the couple and family. A woman cannot forget her experience of birth for the rest of her life. In the recent years, more emphasis is being placed on evidence based medicine. Second stage of labor has been in review by obstetricians since a long time. In recent years, there has been an increasing interest in the physiological approach towards labor with less emphasis placed on time limitations. In this study, it was seen that spontaneous pushing during the second stage of labor was associated with less complications with regards to mother and baby when compared with directed pushing. A similar study was done by Roberts et al. in the year 2002, who stated that prolonged active pushing in the second stage of labor can have deleterious effects on baby and mother resulting in maternal acidosis. Acidosis can be picked up by lactic acid, partial pressure of carbon dioxide and pH at the time of birth. Furthermore, spontaneous pushing results in better descent and rotation of the fetal head, lesser perineal trauma and lesser maternal fatigue in the immediate postpartum period. The findings of our study were relatively in the match with the results of Roberts JE (2002),  and Williams E et al. (2000). They found out that delayed pushing did not increase the risk of cesarean birth or operative vaginal deliveries and it is safe to allow a period of passive descent until the women feel the real urge to push, also the newborn status at birth as measured by APGAR scores, were not affected negatively by the longer overall length of the second stage. Regarding the APGAR score of neonates, in our study the spontaneous pushing group showed a higher and good APGAR score when compared with control pushing. This findings partly agreed with Tuuli MG et al. who suggested a reduction in fetal brain oxygenation associated with maternal pushing efforts. Another randomized controlled trial was undertaken in 2005 by Simpson KR (2006)  to determine any differences between the use of directed and spontaneous pushing techniques in the second stage of labor. 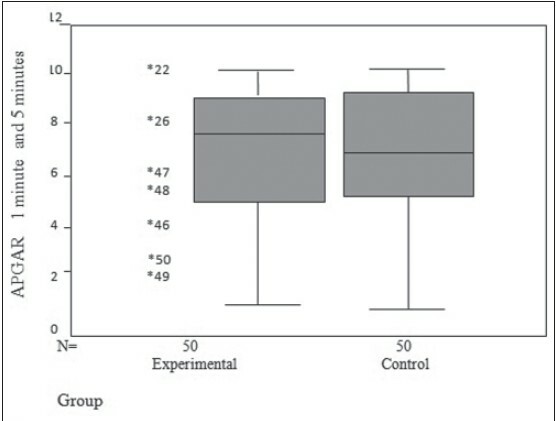 Seventy three multiparus women were randomly allocated to either the control group (directed pushing N = 38) or the experimental group (spontaneous pushing N = 38). Women in the experimental group had longer second stage of labor, the difference between the APGAR score were similar at 1 and 5 min after birth. Regarding APGAR score our study is in line with a study conducted by Roberts 2002,  who cited that the most stressful time for the fetus during labor is in active pushing phase of the second stage of labor. Prolonged pushing and breath holding can cause changes in maternal cardiovascular system and consequently uteroplacental perfusion, leading to acid base imbalance of the fetus and the development of fetal acidosis and hypoxia. There is less postpartum fatigue and perineal trauma in spontaneous pushing during the second stage of labor as compared to directed pushing technique. The majority of the newborns in spontaneous pushing technique have higher APGAR score as compared to directed pushing. Courses, seminars and conferences should periodically be planned for health professionals for promoting the evidence based knowledge and skills about the tender issue of pushing techniques in the second stage of labor. The pregnant women must be properly educated about the course and events of labor during antenatal classes. Simplified guidelines for them should be available, containing information about different stages of labor, effect of using different pushing techniques on the level of early postpartum fatigue and fetal outcome. They must be displayed in the labor ward suites. 1. Buldin C. World health care reforms for childbirth. J Perinat Educ 2010;9:1-3. 2. Prins M, Boxem J, Lucas C, Hutton E. Effect of spontaneous pushing versus Valsalva pushing in the second stage of labour on mother and fetus: A systematic review of randomised trials. BJOG 2011;118:662-70. 3. Thomison A. Pushing techniques in second stage of labor. J Adv Nurs 1998;18:171-7. 4. Pilletesi A. Nursing care of childbearing and childbearing family. A Study Guide to Accompany Maternal and Clinical Health. Vol. 20. Philladelphia: Lippincott Williams and Wikkins 2009. p. 304-5. 5. Parnell C, Langhoff-Roos J, Iversen R, Damgaard P. Pushing method in the expulsive phase of labor. A randomized trial. Acta Obstet Gynecol Scand 1993;72:31-5. 6. Tuuli MG, Frey HA, Odibo AO, Macones GA, Cahill AG. Immediate compared with delayed pushing in the second stage of labor: A systematic review and meta-analysis. Obstet Gynecol 2012;120:660-8. 7. Hukison EC. Measurement of pain. Lancet 1974;2:1127-31. 8. Kelly M, Johnson E, Lee V, Massey L, Purser D, Ring K, et al. Delayed versus immediate pushing in second stage of labor. MCN Am J Matern Child Nurs 2010;35:81-8. 9. Birrell D. Management of second stage labour with an epidural - A problem in isolation? Aust J Midwifery 2001;14:5-10. 10. Roberts JE. The "push" for evidence: Management of the second stage. J Midwifery Womens Health 2002;47:2-15. 11. Williams D, Fraser S, Michael K. Labor and delivery. J Womens Health 2000;13:182-7. 12. Simpson KR. When and how to push: Providing the most current information about second-stage labor to women during childbirth education. J Perinat Educ 2006;15:6-9.